Celebration of Life event will be held July 15th, what would have been Tex’s 86th birthday. Following a brief illness, Donald "Tex" Stevenson left our earthly home June 4, 2017. He is now resting comfortably with our Father, having earned a new set of wings. "Tex" was born in San Antonio, Texas on July 15, 1931 to Odes Pervat and Fawn Taylor Stevenson. He spent his early years in San Antonio, where in the fourth grade he met Billy Sledge. Theirs was the definition of a lifelong friendship, with weekly phone calls right up to last month. During his high school years, the family moved to Sweet Home, Oregon and the new kid in school got a lifelong nickname. He attended Lewis & Clark College on a Football Scholarship. After graduation in 1950, he joined the United States Marine Corps. He served as an aviator in the Marines in both active duty and the reserves until his retirement as a Lt. Colonel in 1972. Many of his most cherished friendships were formed while in the Marine Corps. Once a Marine, always a Marine. 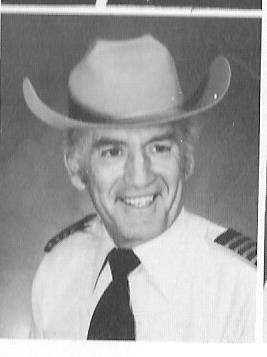 In addition to his military service, Tex flew for Western/Delta Airlines from 1959 to 1991. Not known to be idle, Tex was a Volunteer Fireman in Villa Park, and worked for the L.A. County Jail. Yes, he was an Airline Pilot, Fireman, AND Policeman. Most little boys only dream of this, but Tex made his dreams come true. Tex went on to dream and live even bigger. During a summertime party, he met Marcella "Martie" Saasta, a TWA Hostess, the girl who laughed at all of his jokes. Following a four month courtship, they married on January 26, 1957. It was Martie who suggested Airline Pilot as an occupation after he completed his military duty. Throughout their 60 year marriage, they shared a love for world travel, voracious reading, and challenging crossword puzzles. They created loving homes in Anaheim and Villa Park California, Park City Utah, and ultimately in La Quinta, California. They explored each of these cities with gusto, made many friends and lasting memories. Tex was an avid journal writer, runner, skier (both snow and water), a so-so golfer, good tennis player, and an amazing friend. His humor and wit, his big laugh, and his giving heart will be missed. Tex often shared that his greatest success was his loving family. He was destined for greatness, and the legacy of family and friends is a testament to what a great life he lived. Always curious, always learning, he made a better life for himself and his family. He is survived by wife Martie, their three children; Patti S Sims (Randy), Michael Stevenson (Debbie), Barbie Stevenson-Rodriguez (Omar "Joe"), six grandchildren, Nolan, Stephanie, Taylor, Andy, Ashleigh, and Spencer. And three Great-Grandchildren, Hunter, Grey and Harper. A Memorial Service will be held in Orange County at a later date. In lieu of flowers, please consider a donation to Soldiers Organized Serves. SOS is a local La Quinta charity serving service members and their families. Always one to take to the skies, we know Tex is soaring in heaven. Published in The Desert Sun on July 2, 2017.
a Celebration of Life event will be held later on July 15th in California on what would have been his 86th Birthday. More details on that will follow. In lieu of flowers, please consider a donation in Capt. Stevenson’s memory to Soldiers Organized Services/SOS, a nonprofit organization that supports Marines and their families: SOS, 57539 Santa Rosa Trail, La Quinta, CA 92253.... (760) 777-8955. 45160 Seeley Drive Lot 140 , La Quinta, CA 92253-6890.
was great but his body failed him. by love when he left this world. local La Quinta charity supporting Marines and their families in the area. support, cards may be sent to Martie at: 45160 Seeley Dr. #140 La Quinta, CA 92253. Obituary published in The Desert Sun on July 2, 2017.